This is a passage from the book 'Phoenix Return'. I decided to explore this possibility and visited Iona twice in August 2016 with friends Lu Spotswood and Aiden Turner. Below are my research findings. What would be the effect on the collective consciousness if we were able to demonstrate artefacts of irrefutable Atlantean origin? What if we could prove not only that the myth was real but that their warning of a recurring catastrophe was true too? How more intriguing would be if this information had been given through a spiritual communication, verified by the time-stamped deposition of documents in the British Library? Could this revelation to tip the balance of the human mindset from hostile competition to fruitful cooperation? In the face of ridicule, obstruction and defamation by the scientific community, determined researchers have defiantly studied astronomical, anthropological, geological, literary and even psychic sources in the pursuit of the historical truth of the tale of Atlantis. With their accumulated body of work we are tantalisingly close to a breakthrough but as yet there is no undeniable physical object from this culture to hand to an Archaeologist, no bullet from the ‘smoking guns’ of Gobekli Tepe of and Gunung Padang to prove that a lost advanced civilisation like Atlantis really did exist after all. The research presented here suggests that we could be just a few metres short of the answer. 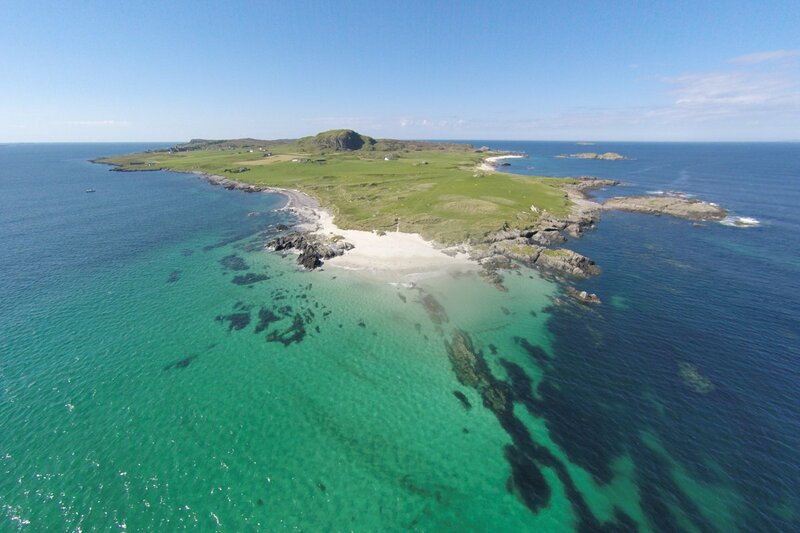 In order to justify an underwater search for these stones it was necessary to verify the likelihood of there having been a pre-historic settlement or temple on the island and so began a review of the available literature on the history of Iona and trips to familiarise ourselves with the island. What follows is a description of our findings and deductions. References and full excerpts are to be found on the accompanying document. The results are astonishing. Iona is a small island off the west coast of Scotland reached from Fionnphort (pronounced ‘Fin-furt) on the tip of Mull by a five-minute ferry crossing. Her coastal waters are extraordinarily shallow and clear and from her western shores there is nothing but the Atlantic Ocean until you reach North America. The island is famous being the birthplace of Scottish Christianity when St. Columba arrived in 563 AD to convert the local tribes but little attention is given to its pre-Christian history. Known in antiquity variously as ‘I’ and ‘Hy’ it was thought to have been named after the sacred Yew of the Druids amongst other things. The map here shows Iona today. For the purposes of our project the important places to familiarise yourself with are Cladh an Diseirt just north of the Abbey, the road from the Abbey to the northern beach called Traighe an t-Suidhe and finally Glenn an Teampull and the Hermit’s Cell which lie west of the Abbey. However, emerging evidence of a settlement on Iona before the arrival of St. Columba is emerging, as reported this year in the Herald Scotland on 19 August 2016…. ‘It has long been regarded as the cradle of Christianity in Scotland, where the earliest missionaries gathered before spreading the Word of the Lord across the land. But now archaeologists have uncovered fascinating new evidence of those who lived on the island of Iona long before St Columba set foot on its shores during preparatory work for the building of an extension to the small school. The Hebridean Isle is home to a religious community, with an abbey founded in 563 by St Columba and 12 companions who had been exiled from his native Ireland. "What is becoming clear is that when the ice sheets rolled back off Scotland some 10-12,000 years ago the Mesolithic hunter gatherers moved onto the islands and followed the retreating ice. There is mention of a very ancient town called Sodora lying in the middle of the island according to The New Statistical Account of Scotland in 1845 (17) and for many years the title of the overseeing cleric was known as the Bishop of Sodora. The map below is included on Rithchie’s map of Iona (see later). No mention is made of this in current guide books. The current Abbey was built by the Benedictines in the 1200’s. Columba’s original monastery was made of wattle and daub and is generally agreed now to have lain in the area north of the abbey in Cladh an Diseirt. (20, 21) and that the stone 'Blathnat' or 'Moel Blatha' (22, 23, 24), a huge red granite stone known in tradition as the table in Columba’s refectory, marks the northern limit as you can see here on Marc Calhoun's blog. Check out these photographs on the Canmore site that demonstrate the Vallum. The house marked as ‘Clacanach’ (which translates as ‘The Stones’ in Gaelic) marks the western boundary of the site. From near here a track over the causeway built above the now-drained lake, leads towards The Hermit’s Cell. The area behind the house was once covered in oak trees and the name of the hillock, Cnoc Daraich means Hill of the Oaks, coincidentally the sacred tree of the Druids. Translations are provided in Ritchie’s book for he was intent on preserving the old Gaelic names of places on the island. Regarding Gaelic names, please listen to this Oral History recording of a local relating local place names and their history. Go to the 32 minute mark and listen to what he has to say about Glenn an Teampull. The ‘Hermit’s Cell’ is just the ruins of an old beehive Celtic monastic hut but which lies some thirty metres from an unexplained and unexcavated monolithic enclosure and walkway. (27, 28) It also known as the Cell of the Culdees, hermetic monks who were thought to be christianised Druids. Cladh an Diseirt translates as ‘deserted place’ or ‘burial ground’ and is an area enclosed by the huge embankment/ditch called the Vellum which as we have seen earlier has had a dating of the lower soil of about 100-200 AD ie. the lower part existed prior to Columba arriving and building his monastery there and must have been enclosing the area for a reason that is it was protecting either a village, a ritual area or both. Interestingly it contains the remains of a monolithic stone gateway, noted to be several feet tall by a writer called Bishop Pocock when he visited in in the 1700’s. He described it as ‘two rough granite pillars which with another lain across the top formed a rude gateway to what was formerly a small enclosure.’(29) This was rectangular and faced due East with a small altar at one end according to excavations in 1800 AD. The remains appear today as below. The lintel piece is missing. Locals say it was broken up and used in the construction of a nearby farmhouse. His contemporaneous sketch and contemporary photos of the stones and places on Iona are available on line at Canmore. Could these be the 360 stone crosses thrown into the sea at the Reformation and the three white marble globes of Clach na Brath? Mr Higgins also has some interesting thoughts on the origin of the name Iona and it being an ancient centre of worship for the female generative power . Likewise he suspects that the nearby Trennish isle of Bac Mor served as the male counterpart. I was meditating one day last summer (2016), looking for guidance because of a lack of direction in life. Almost immediately after closing my eyes I whooshed away and found myself sat on a stone ledge in the cloister at Iona Abbey. A Tibetan monk came and sat down beside me. He asked how I was feeling and I said lost and fed up. He said ‘You work for great spirit and great spirit will guide you.’ Standing up said he was going to show me where the stones I sought were. We walked out of the abbey and turned right up along a long track to the north of the island. He showed me a track where a donkey and cart could go and tip the stones into deep water. He told me to find a map of the island and look for the spot where the water off the shore was deepest. On Ritchie’s hand drawn map, Ru’a Bheoil Mhoir is approximately the same place as the monk took me to and translates as ‘The Big Opening’ or ‘The Big Mouth’. It also corresponds with the small bay above Sand Hills on the Admiralty Map. You can see it very clearly on the aerial view of the northern coast (as we look from north to south) as a small dark crescent shaped bay on right of the photo, closer to you than the sandy bay. Just to hammer home the point, sometime after I was browsing through a library of pictures of Iona and came across a surprising photo. 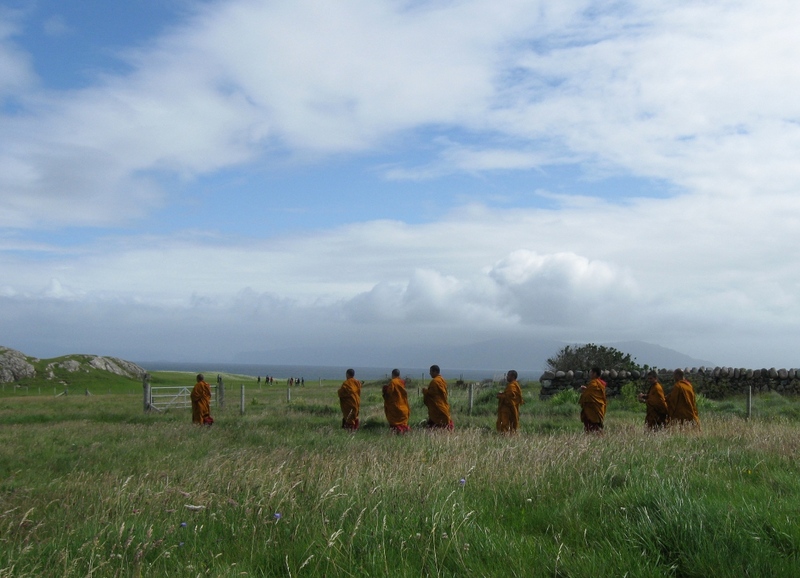 A group of Tibetan monks from the Tashi Lhunpo Monastery, an important monastery in central Tibet and home of the (currently disappeared, presumed kidnapped by the Chinese) Panchen Lhama, had come to stay at the Iona Hostel in 2012 on the north of the island, had performed a blessing on the place of Lagandorain – and had obviously taken a walk to the beach. In summary we have not only found evidence that suggests a pre-Christian ritual centre on Iona and the folklore memory of a temple in Glen an Teampull but we have also discovered that during the Reformation, the Synod of Argyle ordered that all pagan monuments on Iona were to be destroyed or thrown into the sea. We have also learned that the ancient Irish script was laid down perpendicularly like the Ethiopian (Abyssinian) script. This all correlates with the information given in ‘Phoenix Return’ so it is possible that these stones really do exist and are lying on the seabed as described. With the spiritual intervention of Tibetan monks we may have been shown the area to search and conclude that we have good reason for doing so. If the search and recovery of the stones is to be done properly we will need further trips with experienced and professional resources. St. Columba was ordained in the Irish Celtic church before coming to Iona and there is mention of a brotherhood of monks called the Culdees on Iona at the same time who were thought to be either a pre-existing Christian community or converted Druids. Could there have been links between Iona and Egypt? CIVIL AND ECCLESIASTICAL HISTORY of SC()TLANI). EDITED BY JAMES MAIDMENT, ESQ. ADWOCATE. PRINTED FOR THE SPOTTISWOODE SOCIETY. M.DCCC.XLV. 7. Map of Hebridean Terraine on Wikipedia. ‘Clach-na-brath.— This Druidical talisman is said to have consisted originally of three globes of white marble, placed in three basins, but these, like the crosses, were destroyed at the Reformation. There is still a single stone pointed out, and which the boys of the village take care to preserve, so as to make it serve the same purpose. A large stone, resembling the relics of Druidical times, stands in the lawn close to the castle. There is no tradition regarding it, farther than that it marked at one point the boundary between the lands of the M 'lvors and M' Vicars, as already mentioned. ‘In giving the History of Iona, from the earliest period, one cannot avoid speaking for a little of Druidical times, seeing this interesting sect had a College or School of Theology in it for time immemorial, till expelled by St. Columba: hence the most ancient name of the island—Innis nan Druineach—the isle of the Druids. The term Druid is a corruption of the well known Celtic word Druidh, a magician, conjurer, or philosopher. It is the word used in our Gaelic Bible for the magi, or “wise men,” who came “from the East to Jerusalem,” to worship the holy child Jesus. The Druids were the priests or clergy of the Celts. Their religion is allowed to have been of the same antiquity with that of the Magi of Persia, Brahmins of India, and Chaldees of Babylon and Assyria* These all sprung from the religion of ' Orig. contr. Cels. I. b.-Dr Smith. antediluvians. Wherever the Celtic tribes, who were the posterity of Japhet, migrated, they carried this religion along with them, and in no country has it suﬁ'ered so little change as in the Highlands and Islands of Scot land,— so little, indeed, that it made Caesar assert that Druidism had its ﬁrst rise in Britain. The peculiar situation of the Highlands of Scotland, together with the high value the in habitants put upon Liberty, preserved them from being ever subjugated to a foreign yoke. The Roman gods, and Roman eagle, were alike unable to extend their reconnoitre over the mountains of Caledonia. Here, therefore, were raised no altars to their lame idols-here were offered to them no sacriﬁces. God had hitherto permitted the scourge; but here, even at the Grampian hills, he remembered his gracious promise to Japhetil' This, then, accounts for the purity the originality—the orientality of the Celtic character. ‘Columba wasn’t the first to settle on Iona by Mike Merritt Famous for centuries as a centre of Gaelic monasticism and as the home of St Columba, the isle of Iona has a new claim to historical significance with the discovery of what is believed to be a prehistoric village (Mike Merritt writes). The find is close to the site of the isle’s primary school. Pottery, flints and other prehistoric materials found during the archaeological dig could take the history of the island back more than 2,500 years. The items unearthed, and believed to be five times older than the settlement of St Columba’s time in AD563, were made during excavation works for an extension to the primary school. A two-metre wall protecting the village was also discovered. The island is best known for its monastery founded by the monk, also known as Colm Cille, who arrived there with 12 companions having been exiled from his native Ireland as a result of his involvement in the Battle of Cul Dreimhne. The monastery played a crucial role in the conversion to Christianity of the Picts of Scotland in the late-6th century and of the Anglo-Saxon kingdom of Northumbria in AD635. Many satellite institutions were founded, and Iona became the centre of one of the most important monastic systems in Great Britain and Ireland. The new find has excited archaeologists from across Scotland and throughout the world. Two different periods of building were found, with a previously unknown extension to the medieval vallum, or wall, discovered in a shallow ditch next to the school. The extent of the wall may rewrite experts’ understanding of the way in which the community on the island in AD600 and AD700 worked together. The finds may also prove the history of the island is much more complex in its significance to spirituality than the foundations of Celtic Christianity. Due to the constraints of the site, the items will be recorded, samples removed and the site then covered over with concrete. The archaeological work has been carried out by Clare Ellis of Argyll Archaeology Ltd. She said: “A later vallum on Iona was to separate the religious community of the island from the rest of the island. It is likely that the vallum boundary was built in the 7th century. “The remains of a turf bank with a cobble base can also be clearly seen. It seems very likely that the turf bank and ditch are early medieval in date, perhaps 7th or 8th century, and may represent the remains of an unknown monastic boundary, while the underlying soils appear likely to date from the late Bronze Age or Iron Age. Martin O’Hare, of West of Scotland Archaeology, said he was “excited about the finds” and that the extension “could be an ecclesiastical vallum for the main abbey or one unknown about — or even earlier”. He added: “It is sitting in a much larger ditch — four metres wide and two metres deep — which is big. That would be more usually associated with a fortification, though this may not be what it is. It was unexpected. The New Statistical Account of Scotland Vol VII Renfrew-Argyle by TUE MINISTERS OF THE RESPECTIVE PARISHES, UNDER THE SUPERINTENDENCE OF A COMMITTEE OF TUE SOCIETY FOR THE BENEFIT OF THE SONS AND DAUGHTERS OF THE CLEBGY. William Blackwood &Sons MDCCCXLV. ‘From the Bronze Age perhaps to the second millennium BC, only one burial cairn has been recorded on Iona although from about the same time quite a rich legacy of standing stones pepper the landscape of neighbouring Mull. There must have been some kind of a population to put them up for whatever reasons now long obscured yet even those mysterious ancient monoliths have been pressed into service in relation to the smaller island. In the Proceedings of the Society of Antiquaries of Scotland for 1893, the Reverend Thomas McGloughlin claimed to have noted an entire series of standing stones leading along the Ross of Mull between Pennycross and Fionnphort. Upon enquiry of the local minister, the Reverend Donald McPhien, he found that ‘tradition is uniform among the natives that they were intended as guideposts to strangers visiting Iona on pilgrimage.’ This rather assumes that there was already something worth visiting when they were first erected in the pre-Christian era and that enough pilgrims would choose a land rather than the sea route to make the exercise worthwhile. The idea of these dramatic monoliths as markers to a sacred destination has surfaced now and again even though milestones of much more modest dimensions have served just as well on countless other routes. It is hard to escape the conclusion that an extra reputation has been foisted onto the standing stones of Mull because of their proximity to Iona where perhaps curiously there are none at all. Caution may be advised on this pint however as it is just possible that we may not have recognised their sites – they may have been incorporated into other structures or removed. 20. 'The buildings that now remain are of course of much later date than Columba's time. Dr Skene, who has carefully and patiently investigated the matter, is indeed quite positive that the first erections were in a site about ¼ mile to the N of the present cathedral, between Dun-i on the W, and the old burying-ground called Cladh-andiseart on the E. From the lives of St Columba written by Cummin (the white abbot, 657-669) and Adamnan (abbot 679 -704), the original structures were (1) a monastery with a small court, on one side of which was the church, with a small side chamber, on a second side the guest chamber, on the third a refectory, and on the fourth dwellings of the monks; a little way off on the highest part of the ground (2) the cell of St Columba, where he sat and read or wrote during the day, and slept at night on the bare ground with a stone for his pillow; (3) various subsidiary buildings, including a kiln, a mill, a barn, and a cowhouse, which latter was, however, outside the rampart. Not far off was a sequestered hollow (identified by Dr Skene with Cabhan euildeach), to which Columba retired when he wished to pray in solitude. The whole was bounded by a vallum or rampart, the course of which may still be traced. The site of the monastery has already been noted, and St Columba's cell seems to have been within the rampart immediately to the E of the mound known as Cnoc-na-bristeadh claeh, close to the house at present called Clachanach. The kiln was probably about 100 yards NW of Torr-abb, and the mill was in the same neighbourhood. It has left its traces in the small stream to the N of the present cathedral ruins which bears the name of Struth-a-mhuilinn or the mill stream. Remains of old causeways may be traced from the landing places of Port-na-martir, Port Ronan, and Port-na-muintir. Skene's Celtic Scotland, vol. ii. (Edinb. 1877). 23.Moel Blatha pictures are here on Marc Colhoun's blog. What follows is a description of the stone from Edward Trenholme's 1909 book The Story of Iona. You can find a complete copy of that book here (an old photo of the stone faces page 8). 'The great tabular glacial boulder lies between lomaire an Achd and the Sound, and Skene has pointed out how well it answers to a stone which some old Irish documents say was in the refectory of St. Columba's monastery. One scribe's preface to St. Columba's great poem Altus Prosator speaks of "the stone that is in the refectory in Hi; and the name of that stone is Moel-blatha, and luck was left on all food that is put thereon." 24.‘The stone survived the monastery, for the scribes who say "it still exists" wrote in the eleventh century. It was so remarkable that it had a special name, which is considered to mean "flat stone of division." The scribes mention the stone in order to relate how Columba composed a certain hymn, Adjutor laborantium, while carrying a heavy sack of oats, taken from off the stone, to the mill. Everything fits the stone which is still to be seen in lona, near the spot which there are independent reasons for regarding as the site of the first monastery. The refectory which enclosed the stone, to serve as a table or sideboard, was no doubt a wood and wattle building of the old Irish kind. 27. Skene W.F ‘Notes on the history and probable situation of the earlier establishments at Iona prior to the foundation of the Benedictine Monastery at the end of the 12 Century. 32. (A New Statistical Account of Scotland). ‘We now come down to the Reformation. In 1561, the Convention of Estates passed an act, at the desire of the Church, " for demolishing all the abbeys of monks and friars, and for sup pressing whatsoever monuments of idolatrie were remaining in the realm," the execution whereof in the west was committed to the Earls of Arran, Argyle, and Glencairn. The learning of ages which had been treasured up in Iona, the records of nations, and the valuable archives of remote antiquity, which had been safe there under the fury of barbarians, now fell at once a sacrifice. Authorized by this, and by an ill-judged decree of the synod of Argyle, the zealous mob fell upon Iona, as the most valuable and venerated seat of the Popish clergy, and nothing escaped destruction, but such parts of the building and such solid monuments as were proof against the hands of rage. Of three hundred and sixty crosses said to have been standing, only three were left. •Some were thrown into the sea, many carried away, and to this day some are to be seen as gravestones in every churchyard in Mull and the surrounding islands. Pennant says, that the cross at Campbleton was transported there from Iona. Spottiswoode writes that " the very sepulchres of the dead were not spared, but digged, ript up, and sacrilegiously violated. Bibliothecks were destroyed, the volumes of the fathers, counsells, and other books of human learning, with the registers of the church, cast into the streets, afterwards gathered in heaps and consumed with fire." 34. Imray Digital Products – derived from UK Hydrographic Office original chart.